The boardwalk has been a staple of Virginia Beach fun for over a century and was built in 1888 as a five-block, wooden-planked promenade. 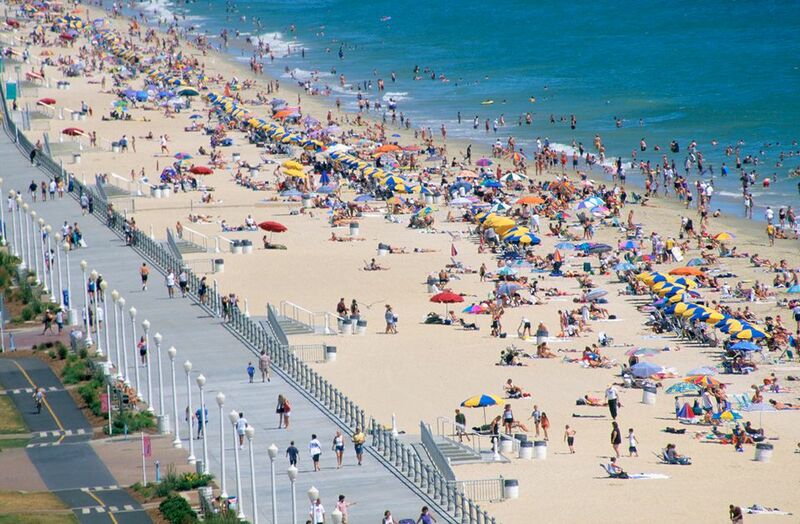 Following $103 million worth of improvements, the Virginia Beach Boardwalk of today is a 3-mile concrete esplanade stretching along the oceanfront from Rudee Inlet to 40th Street. It is 28 feet wide and features an adjacent bike path to accommodate bicycles, rollerbladers, and skaters. Ramps for handicapped accessibility lead from the boardwalk to the beach at each block and wooden walkways at 8th, 17th, 24th, and 30th Streets extend to the water's edge. In addition to the many oceanfront hotels and restaurants that line the boardwalk, there are upscale shops and street-style vendors, amusement areas, historic museums, an array of sculptures and monuments, a fishing pier, live outdoor entertainment stages and much more. Beach Street USA celebrates summer along the Virginia Beach oceanfront with entertainment, festivals, fireworks, and more. Beginning in mid-June and continuing through Labor Day, daily street performers including puppets, jugglers, and magicians create a Mardi Gras-esque atmosphere along the sidewalks of Atlantic Avenue. In the evenings, the stages along the Boardwalk come alive with live concerts and theatrical performances. Seasonal fireworks shows, which are launched from a barge near 20th Street, add to the fun a few nights a week. Across from the fishing pier along the Virginia Beach Boardwalk, this small seaside amusement park offers fun for the whole family. There are go-karts, a 100-foot ferris wheel, a rock wall, and a swinging pirate ship ride. Usual operating hours are seasonal; in the summer, it is open seven days per week through Labor Day and on weekends through September. On the boardwalk next to the Hilton Hotel, Neptune Park is home to a number of popular outdoor annual events including the Boardwalk Art Show and the Neptune Festival, which has sand-sculpting competitions, wine tastings, Symphony by the Sea concerts, volleyball tournaments, a sailboat regatta, and more. There's also a free summer concert series that lets musicians perform for the public during the weekends. Continuing north along the Boardwalk, you will find the popular Virginia Beach Pier, which operates from April through October. During the summer season, from Memorial Day until Labor Day, it is open 24/7. Fees are charged to fish on the pier, but a fishing license is not required. A small fee is also charged to those who just want to walk on the pier and explore. While in the area, visitors with an interest in history can take a pleasant stroll through the Virginia Legends Walk. This landscaped walkway celebrates Virginians who have made important national and global contributions during their lives, including such influential figures as Thomas Jefferson, Captain John Smith, Robert E. Lee, James Madison, Douglas MacArthur, Edgar Allen Poe, Ella Fitzgerald, Arthur Ashe, and more. A prime photo-op spot along the Virginia Beach Boardwalk, the King Neptune statue by sculptor Paul DiPasquale stands mightily at Neptune Park near the Hilton Hotel 31st Street. This impressive bronze sculpture is 34 feet tall (to the height of the trident), weighs 12.5 tons and, in addition to King Neptune, includes an octopus, two dolphins, a sea turtle, a lobster, and 12 fish. Located along the boardwalk in a historic 1903 Coast Guard Station, this two-floor museum celebrates the region's maritime heritage. The collection includes more than 1,000 photographs and close to 2,000 artifacts, which explore the history of the U.S. Life-Saving and Coast Guard Services, Virginia shipwrecks, and World War II. The Atlantic Wildfowl Heritage Museum is located in historic DeWitt Cottage, the oldest beach house still standing along the Virginia Beach Oceanfront. Built in 1895, during the early days of Virginia Beach development, this Victorian cottage has 22 rooms that have been converted into galleries. The Atlantic Wildfowl Heritage Museum displays wildfowl decoys, shorebird carvings, artwork and other artifacts, as well as Virginia Beach history displays. Outbuildings include a Museum boathouse and the first Virginia Beach library. A lovely seaside garden features an array of flowers, shrubbery, and trees. The Museum gift shop offers a good selection of hand-carved decoys, books, bird kites, wildfowl art, and photographs. The Naval Aviation Monument pays tribute to Navy, Marine Corps, and Coast Guard aviation from the early 1900s through the present and acknowledges the connected and vital role of the Virginia Beach and greater Hampton Roads area. Next to the Norwegian Lady monument, the Naval Aviation Monument features bronze sculptures by renowned artist Mike Maiden and laser-etched granite storyboards of historic aviation events. The Norwegian Lady Statue overlooks the Virginia Beach Boardwalk, her gaze fixed toward the ocean in the direction of her twin statue in Moss, Norway. One of the most beloved landmarks along the Boardwalk, the Norwegian Lady stands in commemoration of lives lost and saved during the tragic shipwreck of Norwegian sailing vessel "Dictator" in the spring of 1891. Following the tragedy, the sunken ship's wooden figurehead washed ashore, was found and placed near the Boardwalk, where it stood for more than 60 years. Over time, the coastal winds and salty air took a toll on the figurehead, and it was moved into storage and subsequently either lost or stolen. Through a joint effort on both sides of the ocean, Norwegian sculptor Ørnulf Bast was commissioned to replicate the lost figurehead by creating two bronze statues, one for Moss, Norway, and the other for Virginia Beach. Both of the statues were presented in the fall of 1962 and 12 years later Moss and Virginia Beach were united as sister cities.